It's Australia’s most famous beach. Often the first port of call for backpackers, billionaires, surfers and sunbathers, Bondi's golden crescent and clear, turquoise waters never fail to impress. But there's more to love. Bondi Beach has a vast array of attractions. From chic coffee shops and restaurants to galleries, concerts and beachside yoga. Major festivals go hand in hand with a vibrant local community and one of the most renowned beaches in the world. Check out our event calendar below as well as some handy hints and tips from parking to staying safe on the beach. Held most Saturdays in the grounds of the Bondi Beach Public School. Offering fresh seasonal fruit and vegetables, organic produce, olive oils, spices, poultry, honeys, jams, teas and breads sold by the people who grow or make it. The Bondi Markets are held in the grounds of the Bondi Beach Public School every Sunday. A wide selection of stalls offer; hand made jewellery, arts and crafts, vintage clothing, obscure and wonderful objects of questionable utility, twee but cute things for small kids, retro stuff from robots to furniture and lots of clothing from up and coming new designers. Basically it's lots of fun for all the family. Flickerfest, Australia's premier international short film festival. City to Surf Fun Run, the largest running event in the world, which is held each year in August. The race attracts over 63,000 entrants who complete the 14 km run from the central business district of Sydney to Bondi Beach. Sculpture By The Sea,Each year in spring, a section of the Bondi to Coogeecoastal walk is transformed into a seaside art gallery. Bondi Beach Markets Open most Sundays in the grounds of the Bondi Beach Public School. A wide selection of stalls offer; hand made jewellery, arts and crafts, vintage clothing, obscure and wonderful objects of questionable utility, twee but cute things for small kids, retro stuff from robots to furniture and lots of clothing from up and coming new designers. Basically it's lots of fun for all the family. Bondi Farmers Markets Held most Saturdays in the grounds of the Bondi Beach Public School. Offering fresh seasonal fruit and vegetables, organic produce, olive oils, spices, poultry, honeys, jams, teas and breads sold by the people who grow or make it. 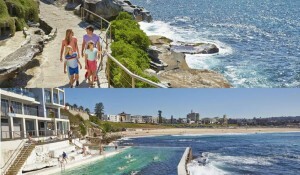 Bondi to Coogee Coastal Walk Combining beaches, rock pools, parks and spectacular coastal views, the Bondi to Coogee Coastal Walk winds its way along 6 km of picturesque coastal paths at the edge of Sydney's eastern suburbs. Starting by the iconic Bondi Icebergs, just above the Bondi Baths, the walk takes between 1-2 hours at a leisurely pace, offering plenty to see and do along the way. 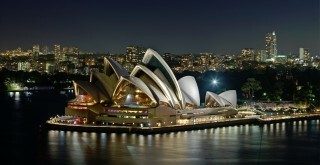 In addition to the many formal cultural activities, Bondi is home to a vibrant cosmopolitan social scene. Bondi Hipsters aside, there is great sense of community, and local activity, from Yoga on the beach, the Aquabumps Gallery, Whale watching, the Bondi to Bronte Swim to the community focused OneWave and the awesome Fluro Friday surf. While a lovely picnic, or Christmas lunch, on the sands of Bondi is high on a lot of people's bucket list, there are some pretty tough restrictions on the consumption of alcohol in public on the beach. Having some serious fun in the sun is still pretty awesome, even without an alcoholic beverage. Keep in mind that on major holidays, such as Christmas Day, bags are regularly inspected on the beach, or in the park. If you bring alcohol to Bondi Beach it's pretty likely that it will be confiscated, and you can be fined. Getting to Bondi Beach, by train, car, bus and plane. Bondi Beach is only 7 km (5 miles) from the Sydney central business district so there are generally plenty of options for getting there. Travelling by car is probably the easiest but the parking near the beach is generally a nightmare. Catching a bus from the city is also pretty easy but it can take anywhere from 45 to 60 minutes depending on the traffic. Catching a train to Bondi Junction and then a bus to the beach is generally a good option and takes about 30 to 40 minutes from the city. Bondi Junction is about 3 km (2 miles) from the beach. Make your way towards the city. If you are coming from the west travel via the Cross City Tunnel, up Ocean St, then left into Syd Einfeld Drive and then another left into Bondi Road. You can catch a taxi from Bondi Junction which costs about $15 to $30, or from the city and be charged between $30 to $50, depending on the traffic. A taxi from the airport would set you back about $35 to $50, again prices depend on the traffic. There are so many options when it comes to staying at Bondi Beach. But the key things to know is that Bondi is a pretty laid back place, it attracts people that are generally less fussed about the fast pace of the big city. That being said you'll find both the humble and the extravagant when looking for somewhere to stay. If you have a good experience let us know and we can write it up. There are a lot of places to stay at Bondi Beach, from Airbnb and backpackers hostels to luxury resort style accommodation. The following is just a small selection. Airbnb Accommodation options on Airbnb range from about $30 a night up to over $1,000, the average, as of December 2015, was about $178. You are bound to find something that matches your needs and it's a great way to have a sneak peak at people places.